English – plus German, Afrikaans and various indigenous languages. Coastal areas cool, rain-free mostly, with fog and day temperatures of 15-25C. Winter day temperatures in interior 18-25C, frost and minus-zero temperatures common at night. Summer average interior temperatures 20-34C, sometimes above 40C in the north. Low humidity in most parts, but can be as high as 80% in extreme north during summer. Rainy season from October – April. Rainfall varies from under 50mm at coast to 350mm in central interior and 700mm in Caprivi. Pack both warm and cold weather clothing. Summer: GMT+2 hours from the 1st Sunday in September to the 1st Sunday in April. Winter: GMT+1 hour from the 1st Sunday in April to the 1st Sunday in September. Currency is Namibian Dollar, or South African Rand (linked 1:1). American Express, Diners Club, MasterCard, Visa, Maestro and European Community credit/debit cards accepted – for others, check with your bank. Advisable to take travellers cheques in US dollars or South African rands. International Dialling Code: +264 plus local area code. Cellphone Operator: MTC – has international roaming agreements with many countries. Cellphone coverage limited to urban areas. Cellphones can be rented, prepaid cellphone cards can be bought. Internet cafes throughout the country – most hotels & lodges have internet facilities. Good postal service – airmail to Europe takes between 4 days & 2 weeks. Excellent private courier services also available. 220 volts AC, 50hz – plug outlets are of the round three-pin type. National airline is Air Namibia. British Airways, South African Airways, Condor and TAAG fly to Namibia. Most international airlines fly to neighbouring South Africa with good connecting flights to Namibia. Smaller air charter companies operate in Namibia. Main airport is Hosea Kutako International Airport 40km (25 miles) from Windhoek. Other airports at Eros (Windhoek), Katima Mulilo, Rundu, Ondangwa, Walvis Bay, Luderitz, Keetmanshoop & 16 licensed air strips. Transport available between airport and city. 15% VAT payable on goods and services. No airport departure taxes payable. Bona fide tourists to Namibia are exempt from paying sales duty or excise duty on luxury items. Visitors may reclaim VAT at Hosea Kutako International Airport, Eros Airport and Walvis Bay Airport. Foreign visitors need passports valid for at least 6 months after date of entry. Visas required for most visitors – check with embassies for exemptions. Tourist visas from Namibian Ministry of Home Affairs and Namibian embassies abroad. Entry fees payable when entering from neighbouring countries. Yellow fever vaccinations for people coming from affected countries. Malaria vaccinations for people going to affected places in Namibia. Inoculations regulations can change at short notice – please check with embassies. The country has good private and public medical and health facilities. Driving on left hand side of roads – speed limits apply – valid international driver's license required. Various car rental companies at airports and in major cities. Regular transport services in Windhoek. Tourism Board registered shuttle operators recommended for tourists. Several trains from South Africa including luxury tourist trains. Excellent tarred major road network, with gravel and sand roads in rural areas. Namibia is politically stable and considered safe. Crime occurs mostly in urban areas. Do not travel unprepared or alone off main routes into isolated rural or wilderness areas. 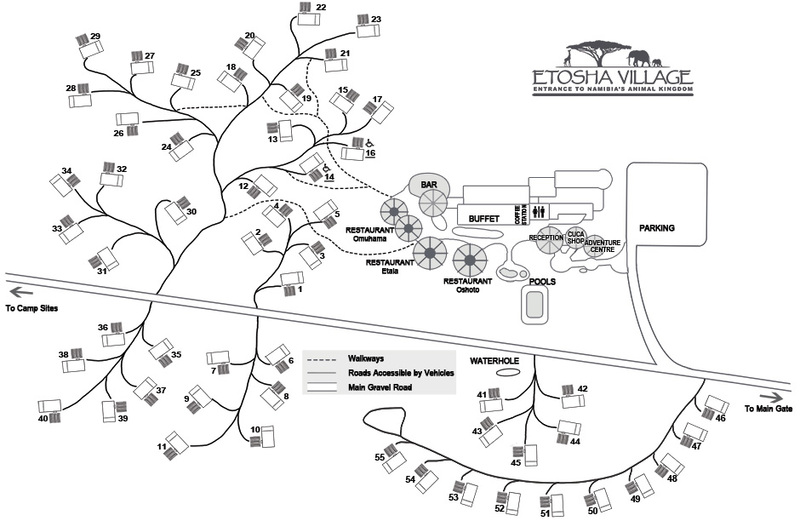 Etosha Village is situated in Northern Namibia adjacent to Etosha - only 2km before the Okaukuejo entrance gate to the famous Etosha National Park. From Windhoek, follow the B1 via Okahandja and Otjiwarongo until you reach Outjo. From Outjo, follow the C38 towards Etosha / Okaukuejo. 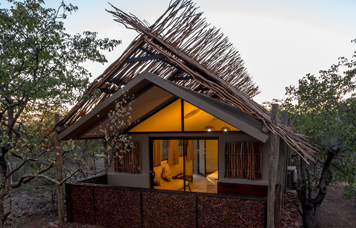 The entrance gate to Etosha Village is located on the lefthand side of the C38 road, approximately 96 kilometres from Outjo. 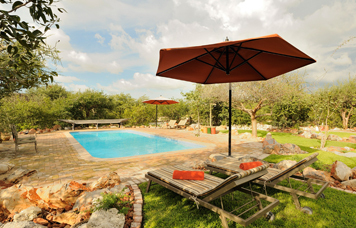 GPS Coordinates: S 19°21' 8.374" E 15°55' 47.855"
You can expect hot, wet summers and cooler, dry winters in Namibia. Generally the days can be quite hot and the evenings and early mornings can be remarkably cool. Comfortable, lightweight clothing (cotton fabrics) for the daytime and a sweater or jacket for early mornings and evenings. 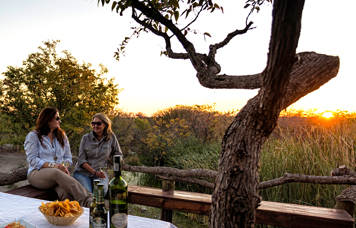 Some neutral colour clothing is best if you will be undertaking game drives / excursions on your trip. Protection against the sun - sunblock, hat, sunglasses, lip balm and moisturising lotion. Flashlight, binoculars and a good camera with extra film or memory card. For electrical small appliances or chargers a conversion plug to a three-pin type outlet. Swimsuit as most lodges and hotels have swimming pools. Insect repellent, rehydrating solutions or concentrates, diarrhoea medication, malaria prophylaxis (if traveling in malaria areas), bandages, etc. Traveller's cheques in US dollars or South African Rands. American Express, MasterCard, DinersClub, Visa, Maestro cards are widely accepted. Some cash to buy souvenirs from street markets. Passport (valid for at least 6 months after date of entry) and Visa's if required. Please note effective from 1 June 2015 unabridged birth certificates for minors is compulsory for travelling through South African ports of entry/exit. Click here for more info from the Department of Home Affairs. Got all the information you need? Make you booking now!